The following graph clearly indicates the level of IIT JEE mathematics questions asked in the year 2014. The blue bar stands for easy questions asked, the red stands for medium level questions asked and the yellow bar indicates difficult questions asked. A thorough study of this graph will help you understand which questions to practice thoroughly. Here the graph shows JEE Mains paper with highest number of easy IIT maths questions being 16 in number, 10 medium questions and 4 difficult questions. Easy level questions must the main focus so that the student gains maximum out of daily practice. JEE advanced paper 1 graph clearly indicates a steep rise in medium level IIT JEE maths questions being 14, with 4 easy questions and 2 difficult ones. The exam pattern is taking different twist and turns so an all rounded practice should be the focus. 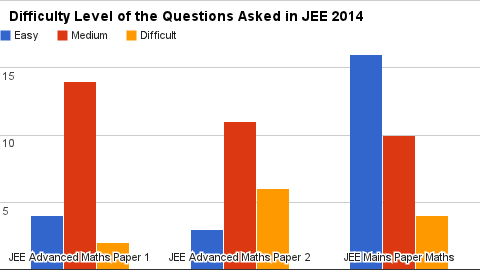 The JEE advanced paper 2 graph stands for 3 easy questions 11 medium IIT mathematics questions and 6 difficult questions. Here the medium level questions are highest in number which just explains what to focus on. All questions are important but variation during practice of IIT maths problems can happen if the graphs are followed correctly.